Quickly and easily update your websites, online communications, portals and intranet sites without the assistance of your web developer. Discover how developing your next website in the OASIS Content Management System will empower you with one of the most flexible and easiest-to-use content management systems available. Taking advantage of OASIS for your next Intranet or Portal will help ensure early adoption and ongoing engagement of the solution among its targeted audience. Discover how OASIS can become an effective and valuable framework for your Intranet or Portal. 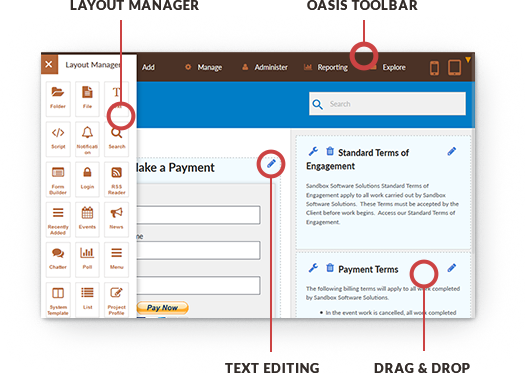 Discover how the OASIS Content Management System makes updating your website, portal or Intranet site quick and easy. Just browse, update and save. © 2016 Sandbox Software Solutions. All rights reserved.